MPG is one of the old file format use for video data. MPG is a number of file extensions for MPEG-1 or MPEG-2 audio and video compression. MPEG-1 Part 2 video is rare nowadays, and this extension typically refers to an MPG or MPEG program stream. The only reason a file is ever given the "mpg" extension is because older file systems and operating systems are restricted to 8.3 file names- that is, 8 letters, a period, and a three letter extension... In this case, MPG mostly uses file converted from VHS tape or VCD players. On the other hand MP4 is latest and widely use video format around the world. MP4 uses MPEG-4 compression which is the advanced / updated form of MPEG-1 compression technique. If you have an old VCD player and you want to play your video on that or any other device which only support MPG file, then you have to convert your MP4 video to MPG format. Mostly video converter only supports advance and recently fashion format, but there is an amazing video converter called “ Wondershare UniConverter (originally Wondershare Video Converter Ultimate) ”. Through this software you can convert almost any multimedia format to any format without backward restriction. Wondershare UniConverter (originally Wondershare Video Converter Ultimate) supports HD quality MPG format which can convert your HD video into MPG with zero quality loss. By using advance “Head-to-Head” comparisons technique, it’s 30 times faster than other common converters. 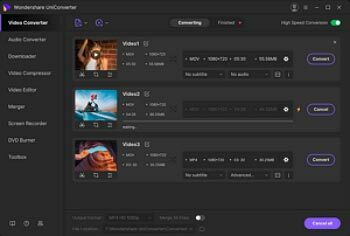 Wondershare UniConverter (originally Wondershare Video Converter Ultimate) supports 1000 formats including latest 4K video format and portable device supported. Including video converting, following are the main key features of this software. Directly convert MP4 to MPG, AVI, MKV, MOV and 1000+ other formats. convert MP4 to MPG in batch with 30X Faster speed compared with common converters. In-program editing tools helps customize your iPhone video, like trimming, cropping, adding watermark, subtitles etc. Wondershare UniConverter (originally Wondershare Video Converter Ultimate)’s GUI (Graphical User Interface) itself is user friendly. You don’t required IT expertise for that. With basic knowledge you can convert videos from MP4 to MPG by yourself. Through this article we further assist you about MP4 to MPG conversion with step by step procedure including screenshots as below, we make the Windows version for example, the Mac version is much similar to the following steps. Step 1Add MP4 files to the MPG converter. Install and Run your Wondershare UniConverter (originally Wondershare Video Converter Ultimate). As this software includes many other functions, make sure you are on the right window. Click the Convert section > the Converting tab. Then click Add Files button for adding the MP4 files you want to convert. Step 2 Select MPG as your output video format for the MP4 to MP4 conversion. Click the drop-down icon beside Convert all files to:, select MPG and the related resolution as the output format from the Video category. Please note you can optionally customize the output format by clicking Create Custom to set frame rate, bitrate, encoder, etc. Step 3 Convert MP4 to MPG. Finally tap the Convert All button to start the MP4 to MPG conversion. Your MP4 files will be successfully converted to MPG. After the conversion, you can click the Output icon to find the converted files. Description MPG is a file extension for an MPEG animation in the MPEG-1 OR MPEG-2 codec. MPEG-1 was designed for coding progressive video at bit rates of about 1.5 million bits per second. It was designed specifically for Video-CD and CD-i media. MPEG-1 audio layer-3 (MP3) has also evolved from early MPEG work. MP4 is a multimedia files extension, which is a container format that can store video, audio and subtitle data (as well as more depending on content). MP4 uses MPEG-4 compression, a standard developed by the Moving Picture Experts Group (MPEG). It became more popular science the stores like iTunes uses this container format, and it is used with iPod and PlayStation Portable (PSP) as built in support, MP4 files have become more popular.